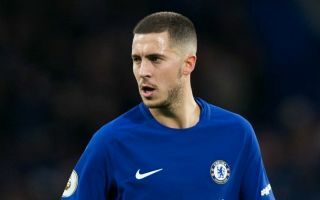 Eden Hazard scored from the penalty spot to give Chelsea 1-0 lead in the FA Cup final against Manchester Utd, however, Chelsea fans are admiring the way he won the penalty. Hazard killed a long though ball by Cesc Fabregas to burst away from the hapless Phil Jones who then made a desperate lunge to bring the Belgian down. With the touch, it gave Hazard the extra yard of space he needed and once he was one-on-one with Jones, he proved to be too quick for the Utd defender. Hazard then netted a penalty in the coolest way imaginable with his trademark run-up that sent Man Utd ‘keeper David de Gea the wrong way. Judging by the reaction from the Chelsea fans below, they praised the diminutive Belgium’s killer instinct and close control. That touch by Hazard sent Jones to the Zoo. hot damn that first touch by Hazard. Wow. That touch from Eden Hazard ALONE deserved a penalty ? Credit when its due, Hazards touch was madd. Lol ???? WHAT A TOUCH BY HAZARD BEST IN THE LEAGUE!!! Hazard’s first touch took Phil Jones out of the game ?